Printmaster Hot Foil Printers | PAK Automation Ltd. The Printmaster range of Hot Foil printers have a worldwide reputation for quality and reliability whilst the print speed potential is unrivalled. The Printmaster ‘S’ can produce an overprint in less than 50 milliseconds giving attainable operating speeds on excess of 1200 prints per minute, making it the fastest on-line contact coder on the market today. * Controls supplied with multi-turn dwell potentiometer as standard. Printmasters feature an easy change foil magazine with automatic foil drive location system enabling downtime for foil replacement to be kept to a minimum. 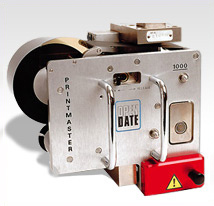 All Printmasters are supplied with an electronic control unit, standard type holder and solenoid valve. They are simple to use and require mimimal maintenance.